Adirondack Vacation Guide: Loads of Snow! 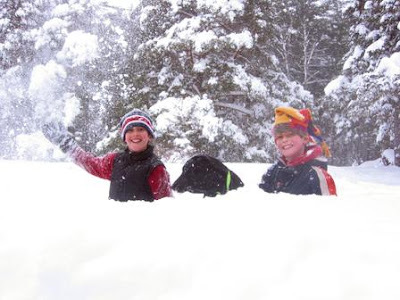 This is a picture of my nephews playing in the snow in Saranac Lake. After the big recent storm that dropped around 30 inches of the white stuff, its been snowing near non-stop this weekend. 73 trails are open at Whiteface, with great conditions. I went Saturday and there was lots of snow and the glades were open! Lots of fluffy stuff to get distracted by. There is great tubing and sledding happening at hills all over town - but the hills are especially long at the Lake Placid Club golf course. Check out Wilmington Road headed toward Whiteface (keep following Main St. south past the Olympic Arena and Stewarts, after the second stop light look to the left). Tubes and sleds are available at Rite-Aid and sometimes Price Chopper. The Toboggan Shoot in Lake Placid is also open! Read about it in my previous post here.